Sometimes, there are moral victories in a loss. 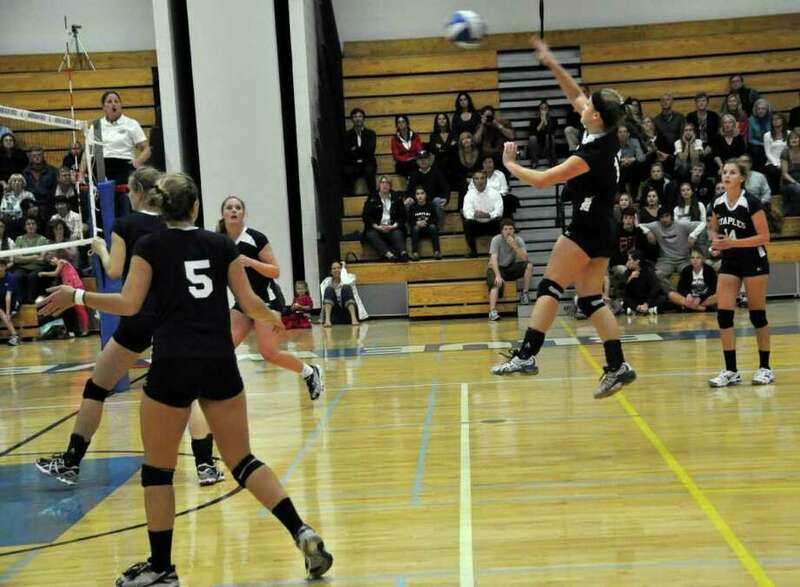 Take the Staples girls volleyball team's efforts in its 3-2 (25-14, 23-25, 25-18, 26-28, 15-8) loss at Darien Monday. Although Staples lost, it was against the premiere program in the state who hasn't lost a regular-season match since 2008, a 3-1 decision at Greenwich. Moreover, Darien has won 20 FCIAC titles in the last 21 years and 15 state titles in 18 years, including nine straight from 2000-9. With the win, the Lady Blue Wave raised their record to 9-0. The Lady Wreckers dropped to 7-1. "We gave them a good run," Staples coach Jon Shepro said. "We've been doing it all season and this team is about hanging tough. We gave it everything we had and it was five hard games but we ran out of gas." In the fourth game, the Lady Wreckers were on the verge of losing the match in four games as Darien had a 24-20 lead. However, Staples senior tri-captain Kenzie Roof (13 digs, four kills, two aces) served four straight points to tie it 24-24. "I was thinking the whole time that we had nothing to lose and I figured to stay calm to the end," Roof said. After a questionable foot fault on Roof gave Darien another match point, Lady Wrecker senior tri-captain Joosje Grevers tipped home a kill to keep her team alive. "I foot faulted in other games, and I didn't look at my feet," Roof said. "I'm not sure [if I foot-faulted] and I have to work on it. I'm glad we came back from it." Grevers said, "That didn't faze us." Staples then took a 27-26 lead with Lady Wrecker junior Lily Rappaport serving. Rappaport (seven digs) came up with a dig to prevent a Lady Blue Wave kill and the match ended on junior Kelly Kosnik's hitting error. "We worked hard and it came in our favor," Roof said. "It's nice to see us coming together." Being the storied program it is, Darien rebounded and dominated the fifth game. Senior Nina Preston served three straight points to give the Lady Blue Wave a 4-1 lead and they never looked back. Senior tri-captain Katie Stueber (14 kills, 17 service points, nine digs, four blocks) and Kosnik (10 kills, three blocks, three digs, 13 service points) had dominating performances for Darien and were the difference-makers in the victory. The Lady Blue Wave opened the match by taking advantage of Staples' errors in the first game and won it easily. With the Lady Wreckers having a height advantage with two 6-footers, Grevers and Augustine Gradoux-Matt, they sealed the middle, which forced Darien to attack from the outside. Senior tri-captain Anna Link (two kills, eight digs) gave Staples life in the second game by serving three straight points to give her team a 9-6 lead. The Lady Wreckers never looked back in the game. The lead peaked at five on four occasions. Grevers (five kills, six digs, five aces, one block) helped Staples attain the five-point cushion with her hitting and a floater serve for an ace. Lady Wrecker setter Dani Kosinski (17 assists, 15 digs, two aces) sparkled in setting up the offense and put Grevers and Gradoux-Matt (six kills, one block) in good position to deliver the kills. Kosinski also hustled for a few digs, tipped over kills and her floater ace made it 22-17. Darien came back and closed it to 24-23 on southpaw Riley Sousa's ace. However, Sousa then served it out to secure the game. Link served five straight points in the third game to give Staples an 11-9 lead. Unfortunately for her and the Lady Wreckers, the 5-10 Stueber, who is the Lady Blue Wave's middle hitter, came alive and starting pounding home kills. Kosnik served six straight points, three aces, to give Darien a 16-11 lead and it never looked back in the game. Amanda Pacilio (eight digs) and Anna Fiolek (five digs, two kills) played well defensively for Staples. Amelia Brackett (one kill, one dig) also contributed for the Lady Wreckers. "We wanted to face Darien for a long time and we came in with the attitude of taking it to them," Link said. "We showed what it takes and we hope we can beat them next time." Despite losing the battle, Staples hopes to end Darien's FCIAC reign. "Darien is a great team and always plays well," Shepro said. "Every year, teams try to take a bite out of the championship but we didn't take a big enough bite. We know we can take them to five. Maybe [we'll beat them] next time." Roof said, "We didn't have it in the end. I'm excited to play them in FCIACs and States."